We weren’t discussing anything technical, esoteric or even the slightest bit complicated. It was about a rodent! I normally let the girls out through the barn in a misguided and fruitless effort to keep more of the dirt and leaves outside and less tracked through the house. The other morning (they’re normally up just a few seconds before sunrise, bless their hearts) when I turned the light on in the barn I heard frantic scurrying. As is often the case, I couldn’t tell where it was coming from. The puppies don’t have such problems. They made a mad dash for one of three large plastic garbage bins that are fixtures in our barn. Two of them are for actual trash, building debris, etc. The third is for puppy chow. The noise was coming from the one used for puppy chow – which I had emptied the night before. I carefully crept up on it and saw a nose bouncing up and down. I assumed it was attached to a body of some sort that was unable to jump high enough to get out. I slapped the lid on it. Me: There’s a critter of some sort in one of the cans in the barn. I put the lid on it. You can deal with it later. He: I’m going to the décheterie this morning. I’ll get rid of it there. Me: How are you going to keep it from getting out in the car? I thought: great idea! Haul it far enough away and it won’t come back and will likely live most happily at the décheterie. He had planned on live-trapping them… They just helped the process along. He: It was one of those lerot. Me: How do know? Did you peak? He: No, I let it out. Me: Why did you let it out now? I thought you were going to let it out at the décheterie? He: How would I get it there in the car without it escaping? Me: But the lid is still on the can. He: Oh, is there one in there, too? Before I can utter a sound, he takes the lid off, tips the can over and 3 more run out, rapidly disappearing back into the depths of the barn. He: They’re kind of cute. He: I’ll have to look into live-trapping them and move them somewhere. I’ll repeat this as well…..
Heat oil in nonstick skillet. Add onion, pepper and sauté until tender, 7 – 8 minutes. Move to sides of pan and add chicken breasts. Sauté until light brown, about 5 minutes per side. Remove chicken. Add garlic, spices and sauté 1 minute. Add tomatoes and cook, stirring up any brown bits on the bottom. Return chicken to skillet. Add capers, olives and oregano. Reduce heat, cover and cook until chicken is cooked through, about 10 minutes. Stir in feta, spoon onto orzo and serve. Looks like the rodents are there to stay, asnd so is this chicken and orzo dish. -chuckles- Always love your little stories, they’re cute and put a smile on my face! Which, I think, is a great way to start off a day. 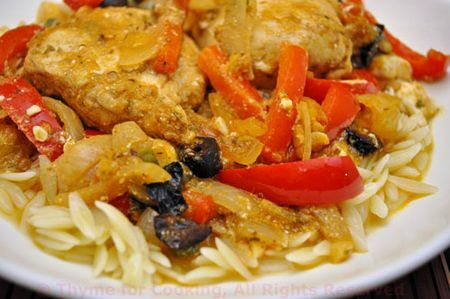 The chicken and orzo look amazing…definitely a must try recipe! I just called the pestilence man in for rodents in my roof – sounds like I meed to send him your way !!! Zoomie, they ARE cute – but a bit noisy and destructive… but the DO eat spiders, so…. Elizabeth, we have that same conversation – change nouns and verbs, so many times….. Sometimes it gets down to ‘What are YOU talking about? Val, I think they like us…. AJ Hwang, glad to make you laugh ;-)) The chicken and orzo is worth a try. manningroad, I need to find out if we have exterminators…. Most people just get a cat. So many of my favorite flavors in this dish. I’m bookmarking. The chicken also would be welcome… in the house with that though… right in my belly. Yum!! 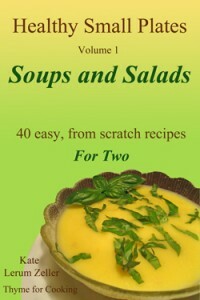 Haha great blog and recipe! Janet, they are cute. The barn shares a roof with the house, so once they’re in the rafters…..
jen, thanks – and thanks for visiting.